1. This Nuclear programs will cost a trillion dollars to the government, therefore cutting research and development into more important conventional weapons causing the US to lose its military superiority. We already have enough nuclear weapons to obliterate most of the world. Making more will not increase their use as a deterrent. More money spent on nuclear weapons means less money spent on conventional weapons like troops, naval ships, airplanes, drones, and missile defense systems. According to Barry Blechman, a weapons expert writing for the New York Times, the modernization of the nuclear program will essentially make our military weaker not stronger. 100 nuclear weapons could kill hundreds of millions of people in any nation. The close to 2,000 weapons now in the U.S. nuclear inventory would obliterate any adversary, and most of the world, as well, many times over. So more nuclear weapons will NOT serve as a deterrent since we can already kill most of the world with the weapons we already have. Not only do we not NEED more nuclear weapons, but we can’t afford the tremendous expense. President Obama authorized a nuclear modernization program that would cost $1 trillion over the next 30 years, and the US is already $19 trillion in debt. So we can’t afford this expense without making major cuts to more important and immediate needs like improving education, making health care accessible and affordable to all, rebuilding our crumbling infrastructure, and improving conventional weapons. Moreover, it will impose an increasing burden on the defense budget, making it difficult to maintain our conventional military superiority – the real guarantee of U.S. security. Judge, a trillion dollars will be going to something that will make our government weaker and less superior. In an age where we have many dangerous countries with immense military power such as China and Russia the U.S cannot afford to lose its conventional military strength. In the end this modernization spending will take away from infrastructure spending, social welfare programs and conventional military programs making the U.S less superior overall and more vulnerable. 2. Nuclear weapons cause severe harm to the climate. Climate change and pollution are real, and not going away. Adding more pollution in the form of radioactive waste is only speeding up the process of make Earth uninhabitable for living things. Nuclear weapons produce toxic pollution at all phases of development: when they are made, test and stored. Nuclear weapons production sites produce vast amounts of radioactive waste, which can have devastating impacts on the surrounding environment.A clear example of this is the Hanford Nuclear Site in Eastern WA, which is the most contaminated nuclear site in the western world. At the height of plutonium production in 1957, eight plutonium production reactors dumped a daily average of 50,000 curies of radioactive material into the Columbia River. Large volumes of radioactive waste have since been stored in 177 underground tanks, 67 of which have leaked a total of approximately one million gallons into the surrounding soil. Today, 53 million gallons of high-level radioactive and chemical waste, and 25 million cubic feet of solid waste, are stored at the Hanford site. And judge, not only do old nuclear weapons have to be stored, once new nuclear weapons are made, they have to be tested, which released toxic radiation into the atmosphere. Do we really need to subject our fragile ecosystem to this pollution? NASA has conducted computer simulations that show if nuclear weapons were actually used at the rate of 100 Hiroshima-size bombs, two to four years after the event, rainfall would decrease globally by an average of about 10 percent. This scenario also drives global stratospheric ozone loss and influences communities far away from the conflict. Agriculture, for example, would likely be disrupted from the combination of cooler temperatures, less precipitation and decreases in solar radiation reaching the surface. This would cause widespread interruptions to growing seasons by producing more frequent frosts. Also, we already have plenty of evidence about how the storage of nuclear weapons causes permanent contamination to the Earth. Since 1945, eight countries have conducted 2,054 nuclear test explosions in locations all around the world. 528 early tests were conducted in the atmosphere, spreading radioactive material throughout the atmosphere. Underground tests have also vented radioactive material into the atmosphere and contaminated soil. Nuclear weapons testing has had a particularly harmful effect on land and marine environments due to bio-accumulation, meaning that radioactive material concentrates in organisms up the food chain. For example, Iodine-131 from US tests, especially during the 1950s, accumulated in rainfall runoff and in soil, which was taken up by grasses, then consumed by cows that produced contaminated milk, which was discovered throughout the US. Despite regulations, there have been many incidents of leaks and contamination from uranium mining for nuclear weapons into groundwater, waterways, and the nearby environment. For example, it was discovered after almost 10 years of operation that a uranium mine had leaked billions of liters of radioactive waste into groundwater at the Olympic Dam in Australia.No closed uranium mine in the world has been successfully cleaned up, and the waste remains radioactive and harmful for tens of thousands of years. We can’t even clean up the mess left from nuclear weapon development from 70 years ago. There is no need to make more nuclear weapons, so why should we continue to contaminate our already polluted Earth with more radioactive waste? 3. The future of US military superiority is in high-tech conventional weapons, not nuclear ones. As we said, there are already enough nuclear weapons to assure mutual destruction of the world many times over. It is VERY unlikely that any war will use nuclear weapons. It is far more likely that the US will use new high-tech conventional weapons to fight its adversaries. According to the Washington Post, a drive to build exotic versions of conventional weapons may sound crazy in a world that already has too much military conflict. But advocates argue that strengthening U.S. conventional forces might be the only way to avoid escalation to nuclear weapons if war with Moscow or Beijing began. Deputy Defense Secretary Robert Work argued for the new deterrence strategy which would leverage the United States’ technological superiority by creating weapons that could complicate attack planning by an adversary. As Russia and China modernize their militaries, the US must exploit its lead in high-tech warfare. In the world envisioned by Pentagon planners, the US could field an array of drones in the sky, unmanned submarines beneath the seas which would be dotted with an array of undersea sensors; “seabed payload pods” that could hide drones underwater until they were needed in a conflict; electromagnetic rail guns that can fire a projectile at seven times the speed of sound, and directed-energy weapons; high-energy lasers that could blind enemy sensors; and a range of other new technologies that could overwhelm an adversary’s battle-management networks. Like the two previous “offsets,” - battlefield nuclear weapons in the 1950s and precise conventional weapons in the 1970s, - this one would seek to restore lost U.S. military dominance. Pentagon officials say they decided over the past year to reveal some formerly top-secret weapons programs because the disclosure would complicate Russian and Chinese military planning. But they say they have concealed other programs to preserve warfighting effectiveness in any future conflict. U.S. officials contend that this push to offset Russian and Chinese gains will have a stabilizing effect in great-power relations, rather than a destabilizing one. “These initiatives would contribute to an effective offset strategy by affordably restoring U.S. power projection capability and capacity, bolstering conventional deterrence . . . and imposing costs upon prospective adversaries.” said Deputy Defense Secretary Robert Work. The future is in high-tech conventional weaponry, and this is an area that the US can dominate. This is where our money and our focus should be, not on dumping money into more outdated and toxic nuclear weapons that will probably never be used. Modernizing nuclear weapons includes not only upgrading our current nuclear arsenal and methods of storage, but developing new and improved nuclear weapons. Replacing with new ones and getting rid of dangerous ones. 1. Modernizing our nuclear arsenal does not mean increasing the number of nuclear weapons, it just means improving them for accuracy and safety which is good for everyone. Unfortunately, we live in a nuclear world, and as a nuclear power we have the responsibility to continually modernize our nuclear weapons. Smaller, more accurate, more secure, and environmentally safer weapons benefit all of humanity. The history of Russia-US arms control negotiations provides many examples of nuclear modernizations that were conditioned upon weapons reductions. In particular, the New Strategic Arms Reduction Treaty in 2010 was conditioned on accelerated funding for modernizing the US nuclear weapons complex and ensuring the modernization of delivery systems. Under terms of the treaty, the number of strategic nuclear missile launchers will be reduced by half. A new inspection and verification regime will be established. According to a Reuters report on February 9, 2017, in US President Donald Trump's first 60-minute telephone call with Russian President Vladimir Putin, Putin inquired about extending the Treaty. Thus, modernization is a mutually acknowledged goal of both world powers. Modernization can result in reducing warheads, improving clean up and storage issues to protect the environment, better security for existing weapons so they don’t fall into the wrong hands, and establishing international inspection schedules. Efforts to modernize our nuclear arsenal benefit all of humanity and should be a high priority for any government with nuclear capability. 2. Modernizing nuclear weapons would discourage other countries, which have more modern nuclear weapons, from attacking the US. At the point our world is at right now, war is a very real threat. The US should modernize their nuclear arsenal not so they can start a war, but so they can prevent one. The truth is, other countries will continue modernizing their nuclear weapons, whether that is a good choice or not. The US needs to keep up so that the other countries see them as a threat. If the US has the strongest nuclear arsenal, other countries will not attack, because they know the US could defeat them. According to former Defense Secretary William Perry, “Today, the danger of some sort of a nuclear catastrophe is greater than it was during the Cold War.” He is very right, as countries are continuing to create more and more powerful nuclear weapons, with no end in sight. Compared to the US’s outdated nuclear arsenal, newer, more complicated, and more fearsome weapons constitute Russia's nuclear arsenal. Russia's RS-24 Yars intercontinental ballistic missile, introduced in the mid- 2000s, can strike anywhere in the US with what some report to be 10 independently targetable nuclear warheads. These 10 warheads would reenter the Earth's atmosphere at hypersonic speeds — around 5 miles a second. According to the Guardian, this bomb is capable of destroying 75% of the state of New York and will “make it uninhabitable for 1,000 years”. In comparison, our nuclear arsenal has not been updated since 1980 and cannot hit anywhere in Russia but a few spots. China has developed a similar platform, the Dongfengjkplk (DF)-41 intercontinental ballistic missiles. According to the Global Times, the DF-41 “is a nuclear solid-fuel road-mobile intercontinental ballistic missile with a range of 14,000 kilometers and a payload of 10-12 nuclear warheads, it can target anywhere in the world and is widely considered one of the most advanced intercontinental ballistic missiles.” By next year, China is expected to be capable of delivering a nuclear strike anywhere in the continental U.S. for the first time in its history. 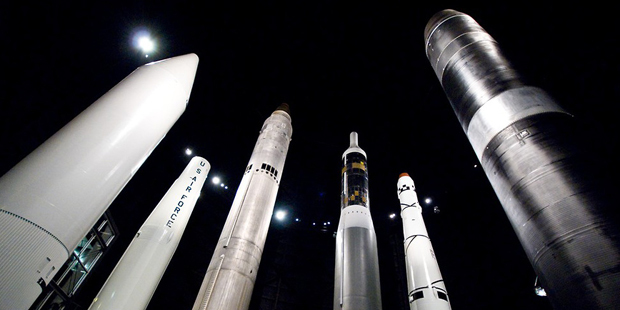 Currently, the US simply has no way to defend against a salvo of such devastating nukes. In comparison, the US's Minuteman III ICBM also reenters the atmosphere at hypersonic speeds, but it carries just one warhead and was introduced in the 1970s. And according to the BBC, even North Korea's’ new nuclear bomb has an explosive yield of 30 kilotonnes, which is almost as big as some of the nuclear warheads in the U.S.’s arsenal. Clearly, other countries have and are developing nuclear weapons that are stronger than what the US has. We have to modernize ours so that these countries still see us as a threat. All the US has to do to protect itself and its citizens is continue to modernize its nuclear weapons. It is worth it, because we will be protecting the citizens of the US, and our allies around the world. 3. Old nuclear weapons are a threat to our environment. Abandoned launch pads and equipment used for obsolete nuclear weapons is contaminating our environment. If we put money into modernizing our nuclear weapons, we can also clean up and correctly dispose of our old nuclear arsenal. The U.S. government has closed many former missile silos, but that doesn’t mean the environmental risks are gone. During the height of the Cold War, the U.S. government needed a way to store its nuclear missile arsenal so it would be safe from an enemy attack, while still able to quickly respond to threats. The result was a series of "missile silos" that dotted the landscape for miles, often located on farm land. All told, at one point there were more than 1,000 missiles buried several stories underground in these silos. These silos are incredibly bad for the environment and overall safety. In recent years, the need for a massive nuclear arsenal has decreased rapidly, now that the Soviet Union has dissolved and the threat from major nuclear powers has]diminished. As a result, most old missile silos have been retired, and their contents removed. But the fact that a silo is no longer operational does not mean that the threat of toxic contamination has been eliminated. The U.S. Army Corps of Engineers has been working with the state of Wyoming to identify and remove tri-chloro-ethylene (TCE) from groundwater sources. TCE has many uses as a rocket cleaner and can be found near old missile silos. However, it can also cause cancer and liver damage. Even decades after the fact, environmental damage caused by defense activities can be dangerous. If we put money into modernizing our nuclear arsenal, we could clean up the left-over chemicals from old nuclear weapons storage and create new and safer ways to store the radioactive materials.